In the 20-plus years since first being established in Singapore and Sweden, Single Windows (SWs) have remained the central focus of border clearance strategies. The implementation of such an environment is generally seen by trade experts around the world as a very practical means of improving border clearance performance. Although the SW is but one aspect of a myriad of mechanisms to improve the effectiveness of trade facilitation, it is quite an important one. This article presents an overview of a project undertaken by the African Alliance for e-Commerce (AAEC) to assess the impact of SW architecture on trade transactions in five African countries. Created in 2009, the AACE groups SW operators in Africa with a view to promoting the concept of a national and regional SW, and has established a platform for exchanging SW implementation experiences. Eighteen operators are members of the Alliance. With SW solutions implemented by its members having reached a certain level of maturity after more than 10 years of operation in some countries, in 2014 the AACE decided to conduct an exercise in five selected countries in order to evaluate the impact of existing systems on the cross-border process. 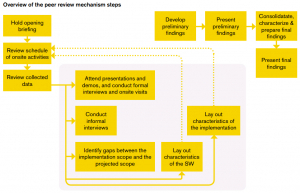 To do so, a peer review mechanism was chosen. Representatives of countries involved in the exercise, namely Cameroon, Ghana, Madagascar, Mauritius and Senegal, reviewed their respective systems with the support of World Bank experts. SWs for business-to-business (B2B) transactions – the less common form of a SW, often used as a complement to the two previous models, is a platform that connects different business parties to a trade transaction. establish a roadmap for a regional SW.
logistics process of a container. Step 3: ‘Path of Improvement’ – The results of the assessments, along with the experiences of each country, including best practices, were identified and shared among AAEC countries during a Conference. A roadmap for improvement, developed by the World Bank and pair countries experts, was also provided to each country. better capacity to deter the use of falsified documents as it has become easier to authenticate documents. As for calculating the return on investment (ROI) in the technology, this issue will be addressed in the next round of assessment. The SWs which were evaluated do not yet deliver their full potential, mainly because they focus on the submission of data and the information process only. The business process and services were developed with the objective of replacing paper documents. This limitation is understandable, considering the level of maturity and ‘readiness’ of the organizations and trade environments involved. Whilst dematerialization is an important efficiency gain for end-users, it does not impact on other areas of interaction between end-users and government agencies, and does not support internal collaboration and information-sharing processes. The SWs are now a channel for submitting information and documents, replacing the previous manual paper-based transactions. However, little else has changed with regards to the decision-making process and internal processing by administrations. Very little innovative and forward thinking has occurred to take these SWs to complete maturity. Enabling internal communication and collaboration during the clearance process, as well as the sharing of strategic information among agencies, is not yet possible through the SWs which were assessed. Internal data could be further integrated to support and possibly automate decisions or parts thereof. Goods inspections could be coordinated, and inspection results and risk assessments shared to reduce delays. Moreover, the SWs support very little interactions beside the submission of documents by the trader to an administration. All five SWs assessed have functionalities to provide transaction status updates and to allow messaging between the actors, but these services can still be improved to increase the user benefits from the system and to fully move to a transparent and paperless trade environment. It could, for example, enable a user to seek information prior to a transaction, or to get an explanation from government authorities having rendered a decision, or to communicate with those involved during the decision making process.